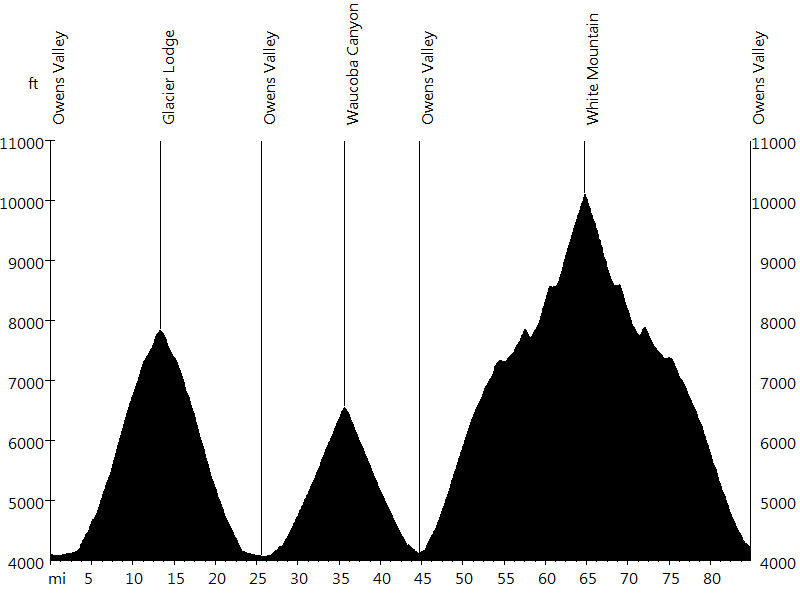 The Everest Challenge, held in the Eastern Sierra, is the California/Nevada State Climbing Championship - the hardest two-day U.S.C.F. (United States Cycling Federation) race and ride. The route allows a view of many of the fourteeners in California, including Mount Whitney, the highest peak in the lower 48 states. The total elevation gain is close to the summit elevation of Mount Everest, the highest peak in the world. 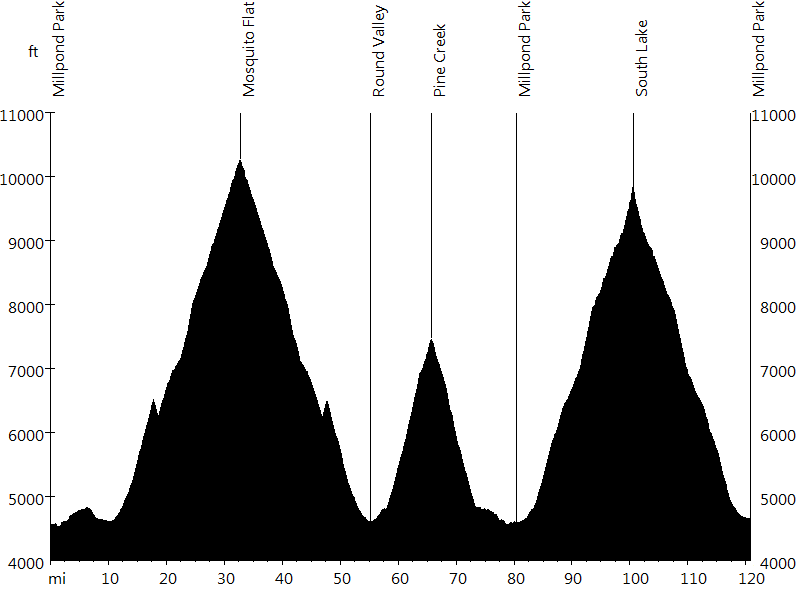 Each day includes three major out-and-back climbs, half of them top bike climbs in California. The time is stopped at the top of the last climb of the day, on day one at mile 100 and on day two at mile 65 (all climbing is done in 165 miles). 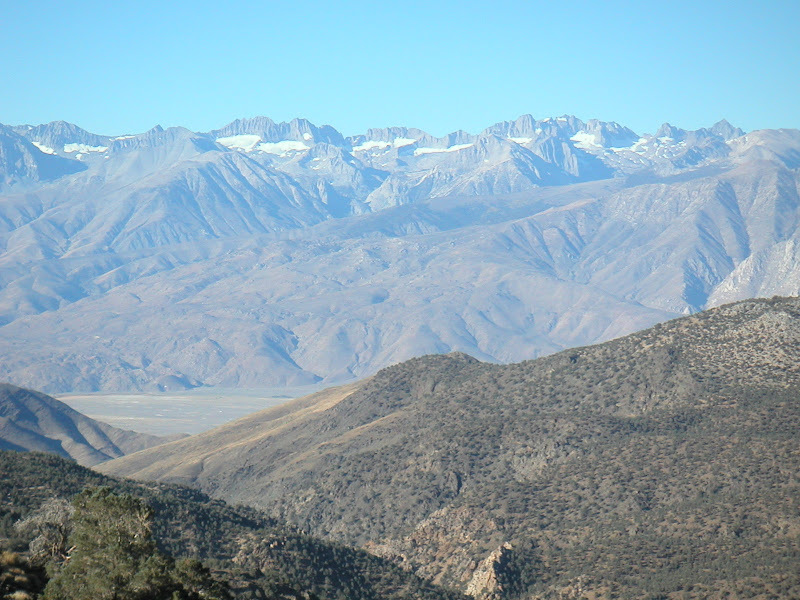 Day one starts in Bishop (4,425 ft) and climbs to Mosquito Flat (10,250 ft), Pine Creek (7,420 ft), and South Lake (9,835 ft). Rock Creek Road, which leads up to Mosquito Flat, is the highest paved road in California. 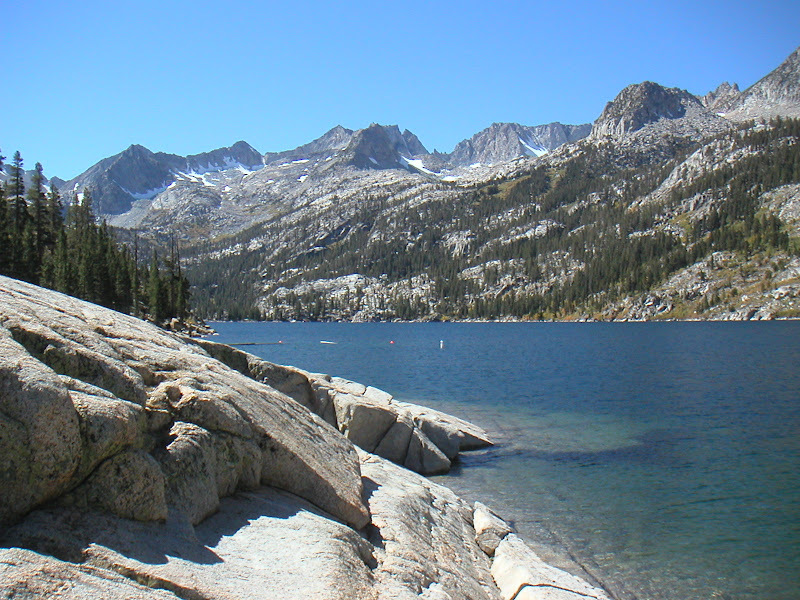 Mosquito Flat is 22 miles long with an average grade of 5% and an elevation gain of 5,825 ft. Pine Creek is 8 miles long with an average grade of 7% and an elevation gain of 2,995 ft. South Lake is 20.4 miles long with an average grade of 6% and an elevation gain of 5,410 ft.
Day two starts in Big Pine (3,940 ft) and climbs to Glacier Lodge (7,800 ft), Waucoba Canyon (6,538 ft), and White Mountain (10,100 ft). Glacier Lodge is 9 miles long with an average grade of 8% and an elevation gain of 3,860 ft. Waucoba Canyon is 8.5 miles long with an average grade of 5% and an elevation gain of 2,598 ft. White Mountain is 21 miles long with an average grade of 6% and an elevation gain of 6,204 ft. It was great seeing John W. and Tom DeB. from San Clemente as well as Jim M. from San Diego and Tony M. from Cherry Valley, riders I met at the Son of Death Ride.